What can I say that you don’t know already about Mr. Vidal Sassoon. Although he hadn’t actually cut hair himself since 1966, his achievements were such that he was, and always will be, a legend. And will probably go down in hair history as the most famous hairdresser, ever. His “Bauhaus-inspired” geometric and asymmetric haircuts including Mary Quant’s geometric architectural-inspired cut, the Nancy Kwan bob, the five-point cut on Grace Coddington, and others took the world by storm in the 60s, his era, at which time he liberated women’s hair and revolutionized the salon industry. His influence was so great that Vidal Sassoon staff today and most of his ex-es still cut only as he did to this day, after all these years and lifestyle changes. They believe. He certainly knew how to market his brand, from the beginning, but he hadn’t actually been associated with it since 2004. However, in 2009, he was appointed Commander of the Order of the British Empire (a CBE) which, with all he had done, is more than just impressive, especially for someone born in poverty and brought up in an orphanage, as he was. 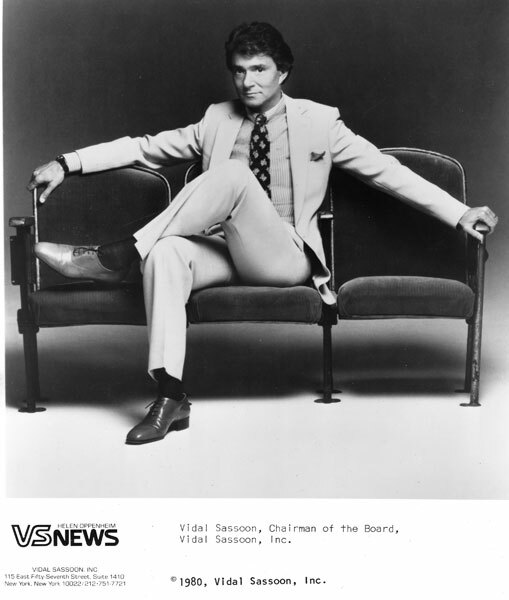 From May 1979 to May 1981, I was the in-house PR and Creative Concept Director for Vidal Sassoon and his 5 North American Salons – in New York, Beverly Hills, San Francisco, Chicago and Toronto. I had turned them down 5 times before being wooed to take the job on. I should say jobs. Because when I finished PR for the day, I all too often started another day around 8 pm, at the salon, when clients were gone, as Creative Director. Which meant I was working on new hair trend collections or shows or whatever with the staff to all hours. We did two major photo collections a year, and some in-between and there were always something going on. As a non-hairdresser, being senior to the elitist Vidal Sassoon staff at that time was no easy job, and most resented me, to the extent of actively being a pain. As was the then President of the Salons who definitely did not support me for about 6 months, the same 6 months it took Vidal to fully support me. Nevertheless, during my 2 years there, we produced the only Vidal Sassoon hair trend collections ever to be given worldwide recognition and publicity out of America. Soft Cubism made 98 newspapers, many magazines, TV and more in the US. Then came HighHair, which the whole world copied, it got massive PR exposure. Hair hadn’t been high on top for decades so this was very new then. There could be no teasing, of course, because Vidal Sassoon had changed the stiff hair high on top from past eras and it was important fingers could run through hair. My mandate from Lawrence Taylor, who hired and supported me, was to soften the Vidal Sassoon image because Sassoon was into hair care products and the punk hairstyles the staff were doing at that time weren’t appropriate for the products. This is what I tried to do. I moved ahead from the usual hard-edged geometrics, with some flattering contemporary updated styles which were still Sassoon-influenced. Vidal himself never really got what I did and he never published the photos in any of his books, so you probably haven’t seen these photos before, unless you were around at the time they were first released, 1979 to 1981. You can see these and other Sassoon campaigns I produced in these Archives and judge for yourself if all the dedication and sheer hard work was worth it because I worked long hours, many weekends, too, as did Graham Wren, the International Artistic Director at the time, and Avram, who put his degree in Fine Arts from Boston University to good use in these photos, as did Edward Moore, colorist, who had a degree in painting, maybe two. A lot of hairdressers and staff helped make all we did possible, those who got what I was trying to do, like Damien, Thomas, Mary-Lou, Jehr, Steven, John, and others, but Graham, Avram and I were a team and we did most of the creative work, living Vidal Sassoon day in and day out to make these photos and hair ideas happen. The toll was very high for all of us, in many ways, and I left after 2 years, to be replaced by no less than 5 people! Mitchell, thank you for having such faith in me, I really appreciate your words. Nice piece on a good chap Helen, this is how Vidal looked in the days when I knew him. Too bad that the company didn’t use more of your direction vis-a-vis styles, you always were a leader and they could have used it. You were a very creative force at doing exactly what you believed in and you were supported vigorously by Lawrence Taylor and indeed followed his mantra. If I’m not mistaken, Thomas Yeardye was in charge of Salons worldwide by then, before I became President and CEO of Vidal Sassoon in 1979. I ran and built the salons and schools USA, before I started and ran the products company. I respect your contributions immensely although I occasionally disagreed with you! More contact that wasn’t filtered would have been a good idea but in fairness my product functions simply didn’t allow me to interface with you more often. Congratulations on your Talent with continued respect for great work. No, Thomas Yeardye wasn’t there when I was at Sassoon. Never met him. Thank you for sharing such interesting information on legend Vidal Sassoon!